Hope you all doing good…. Back to my event J sorry friends because of personal reason did not post my Friday chat for the past couple of weeks…. Thanks for the response and continuous support. 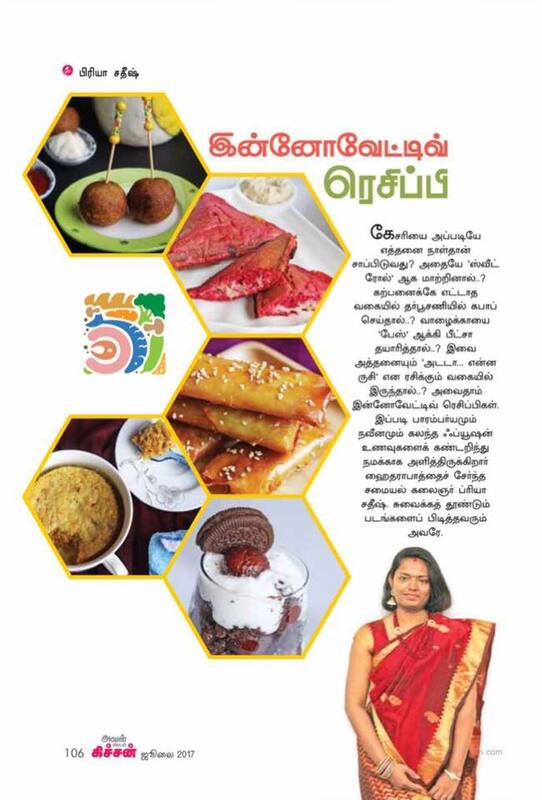 And for the first guest approached another sweet friend, Viji from Virundhu unna vaanga. Happily she accepted my request and prepared yummy sweet. And later received lots of response to get participate. Special thanks to everyone who participated in my event and for accepting my invitation to join my event. 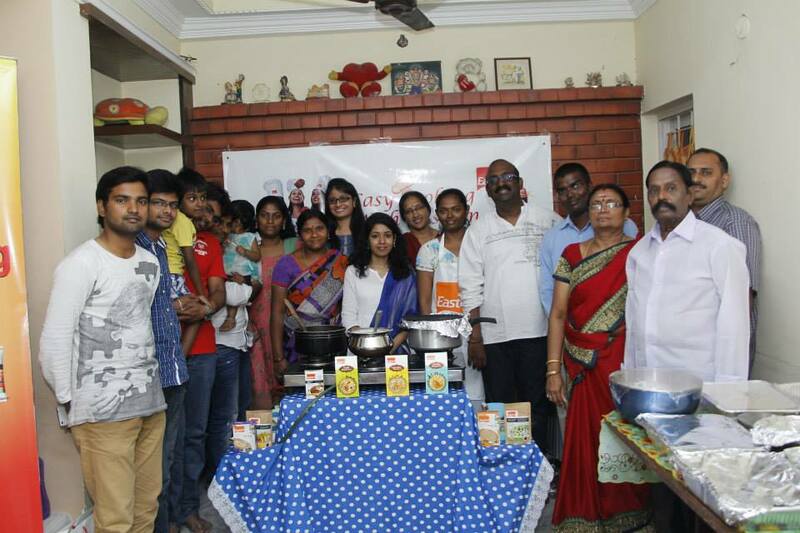 And here comes our ninth week guest………… Poorni from Easy and Homely Cookbook. Are you all waiting for the exciting news??? No more delay…. Am planning to select one lucky winner after completing 10th week. So one blogger among 10 will get an amazing gift. So after completing every 10 weeks, one blogger will get a chance to win a prize…Will post the first gift soon. Are you ready to participate and get a chance to win?? 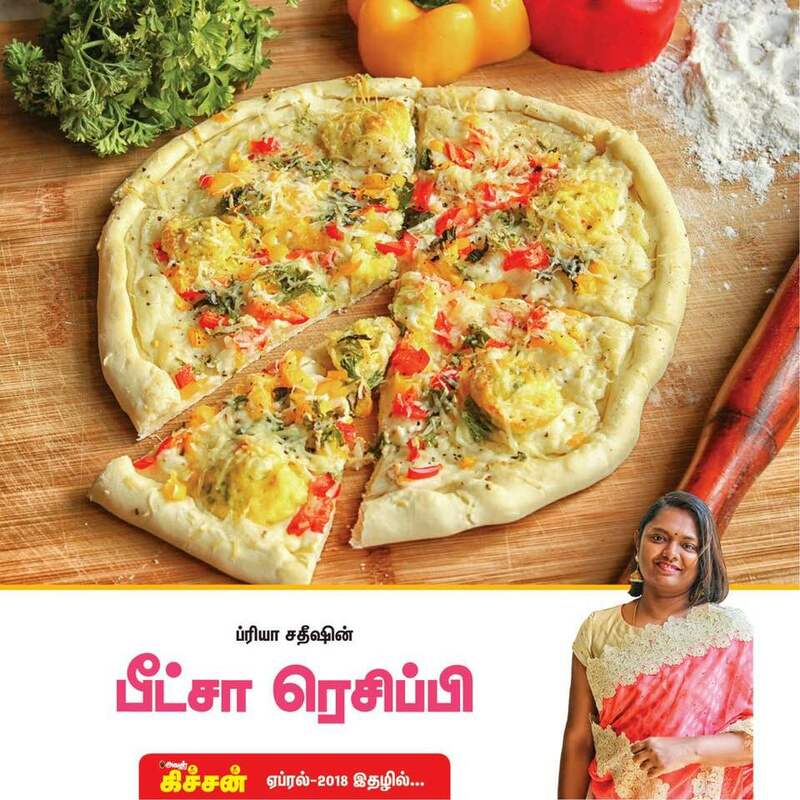 I visited her blog on may 2012 and the first recipe which I noticed in her blog was “ Crispy Wheat Dosa “ . 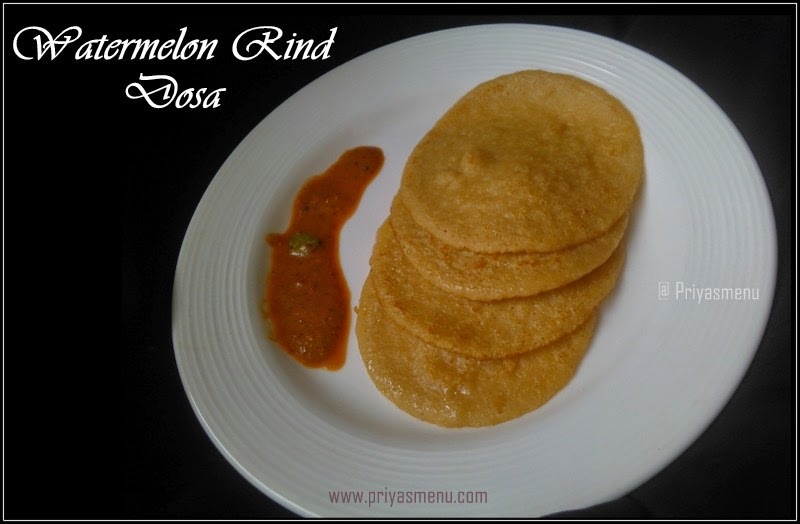 I never knew that crispy dosa can be prepared using wheat flour like rawa dosa. Tried that immediately after viewing and it was delicious. Till now am preparing wheat dosa in her style J and all my family members loves it. 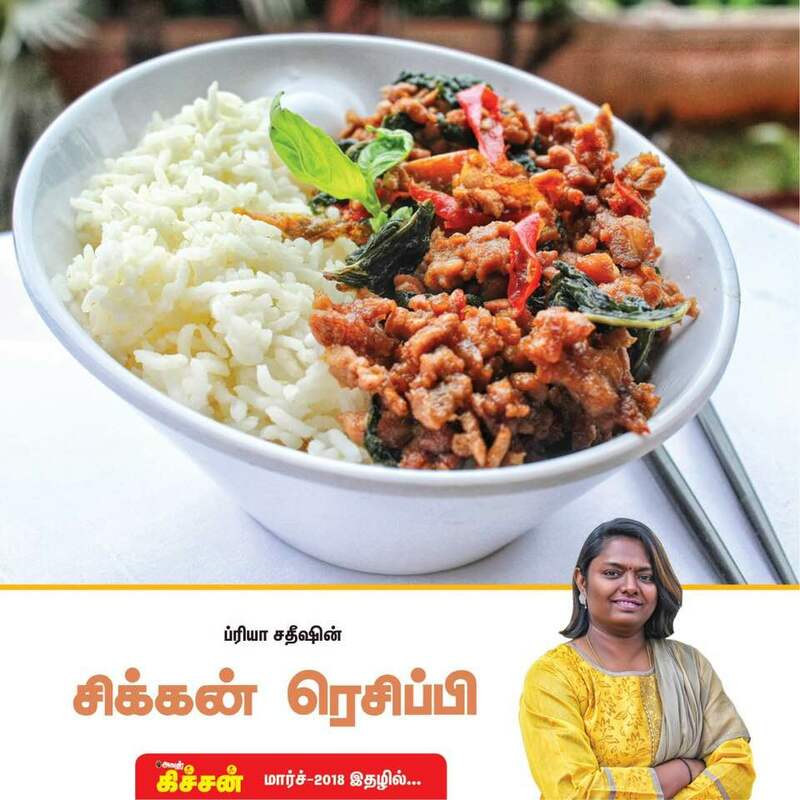 I love all her recipes and some of them are my most favorite like Kathirikai murugakka karakozhambu, chicken 65, ChickenChalna, Mutton Vathakal, spring onion chutney and Ragi vada… There are more delicious recipes in her space too… Don’t miss to check it out. 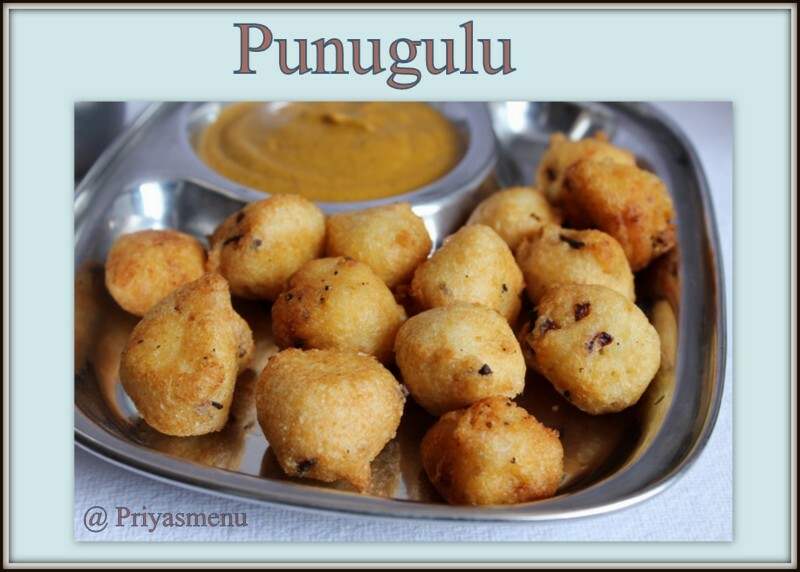 My mom is my greatest Support and then my Husband..
Poorni : I could learn food culture and my interest towards cooking has increased..
Poorni : When my house was filled with sudden guests, the first thing that will come to my mind is Pakoras/Vada along with NanariSharbath..
share with the link if you had posted in blog. 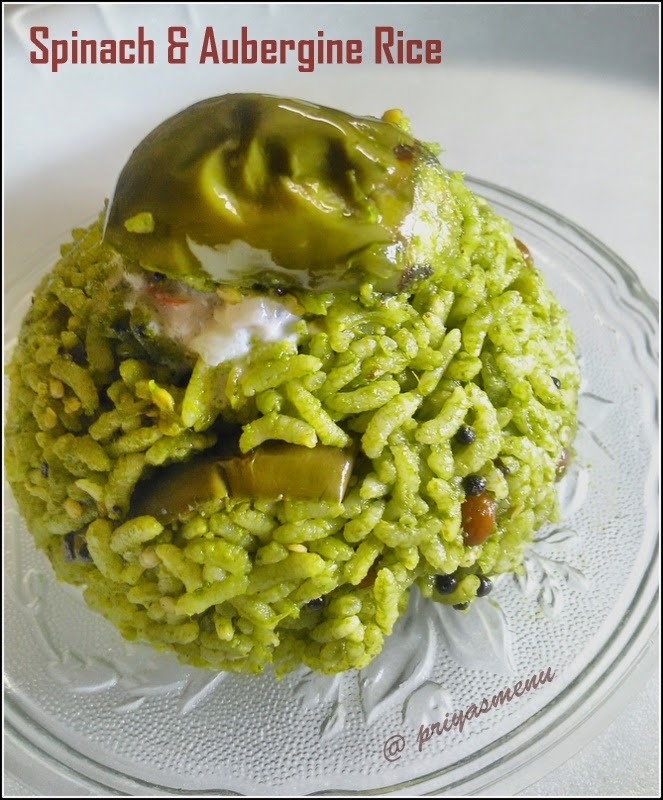 Non-Veg : Chicken Biriyani and Chicken 65.
recipe which you tried first? 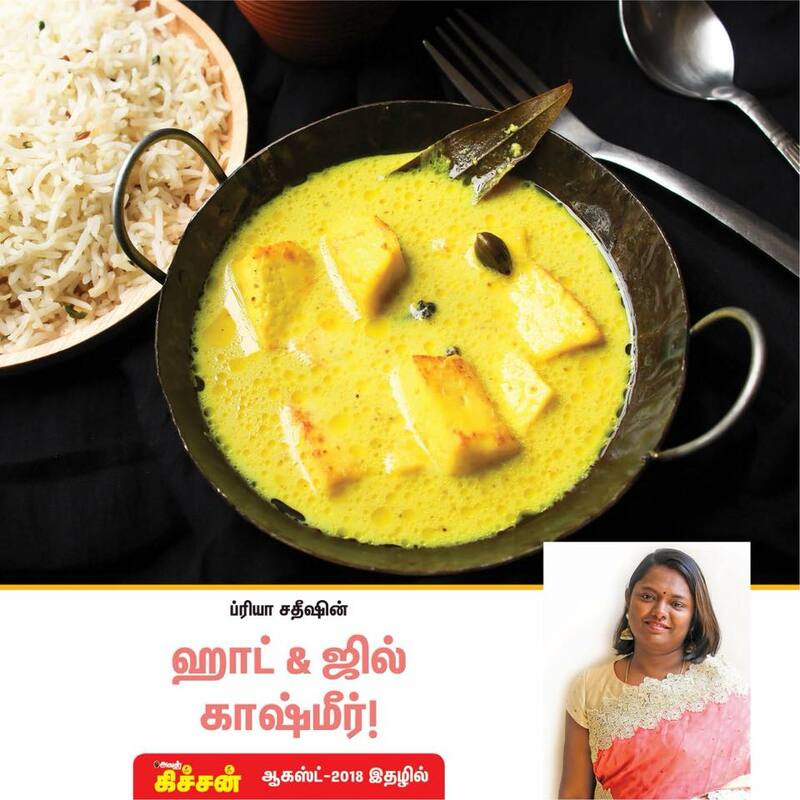 Poorni : While I was working at Chennai, I stayed with my friends and I tried Simple Egg curry and fried potatoes to have with Rice. This was my first cooking experience. I had a call with my mom and prepared this. While preparing tea, Add tea powder, sugar and water in a vessel and allow it to boil for 2 mins till the tea powder and water mixes well. then add milk and boil. This will prevent the tea powder to get sticked with the vessel. So, it will be easy to wash the vessel as well. When you buy fruits like apples and Oranges, mostly don't try to refrigerate unless you require it. That will dull the taste. try to eat it freshly. While preparing Sambar, You can place all the necessary vegetables in a small container and boil it along with the Dal itself in the pressure cooker. This can save gas. Cif is the best product that I use to clean the Stove. It removes the grease very well. 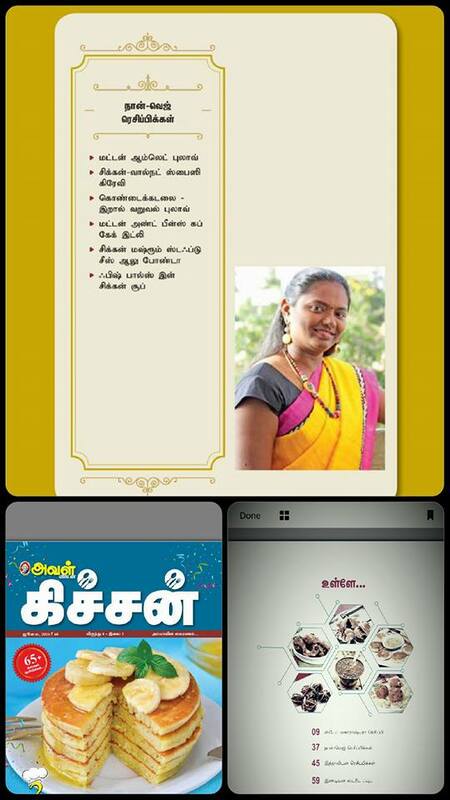 Poorni : Your blog is simple and neat with easy to understand steps. 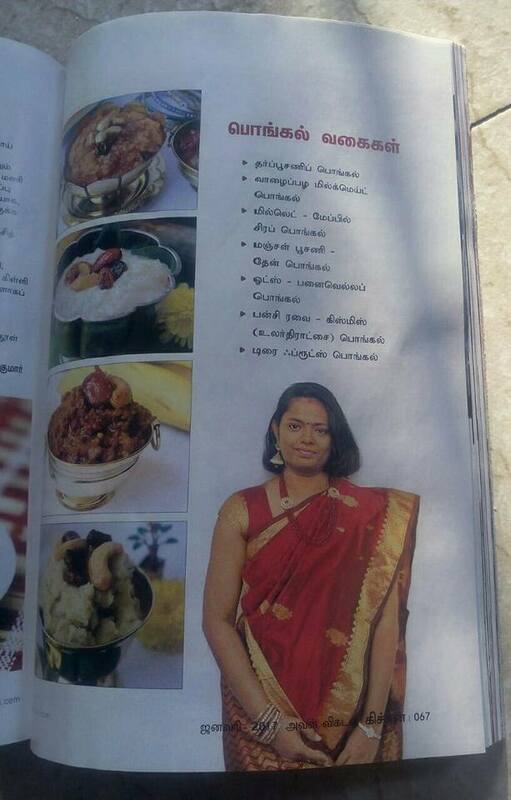 You have a good collection of south indian recipes and esp I love your Chutney recipes. 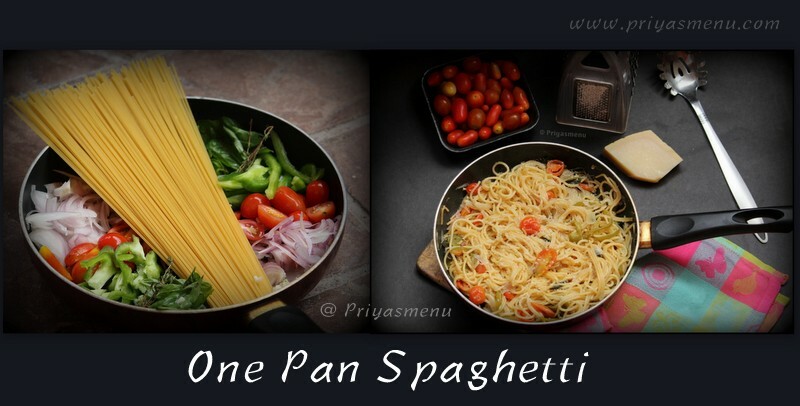 Keep going..
Dear Friends..Am so happy to write my Guest post on Priya's Food Lovers Page. She is an amazing active blogger and her page has so many unique recipes. I love her activeness when she participates in the event. My favourite recipes on her blog are Chutney Recipes. Keep going Priya. Coming to the Recipe. I love Tofu very much due to its softness and helath benefits. I always wanted to try different recipes and Tofu. 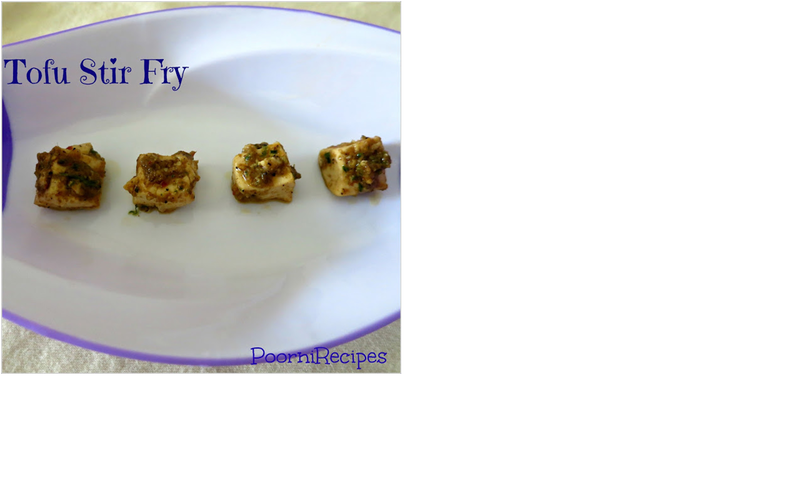 The below is a very spicy Tofu fry which can be prepared in minutes. It serves as a good starter. I used the Tofu that is loosely available. If you are going to use packed ones, use Tofu for frying purpose - silken tofu. Coming to the Recipe..
1. In a Pan, heat 1 tsp of oil and fry the tofu for few mins and remove from the flame and allow to cool down. Cut the Tofu into lengthwise pieces. you can also cut it into cubes. 2. Dry Roast and Grind the items mentioned in "To Grind" Section to a fine paste and keep aside. 3. In a pan, heat oil and add the Tofu Pieces. 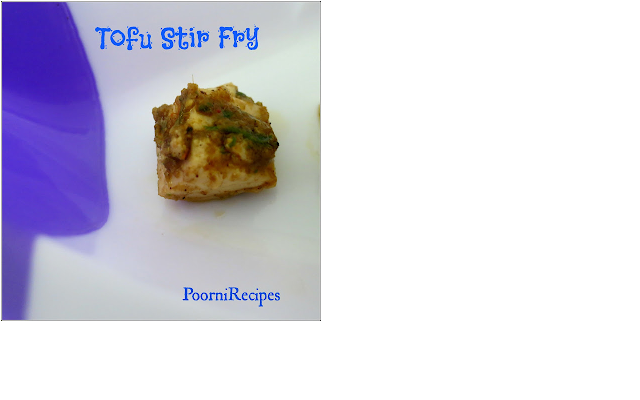 Fry it for few minutes. Add the ground masala, salt and keep stirring till the masala gets mixed with the Tofu properly. Don't add water. 4. Finally sprinkle Garam Masala and stir for few seconds and remove from the flame. 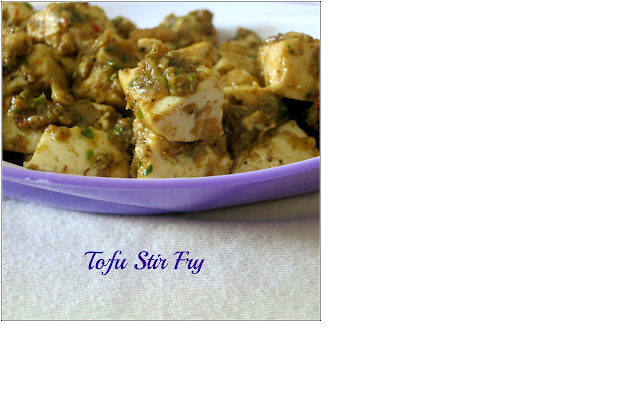 Spicy Tofu stir fry is ready to serve. Don't forget to fry the Tofu before you cook. So that it will be easy to cut and cook well. According to your taste, Add Pepper and chillies to make it spicier. 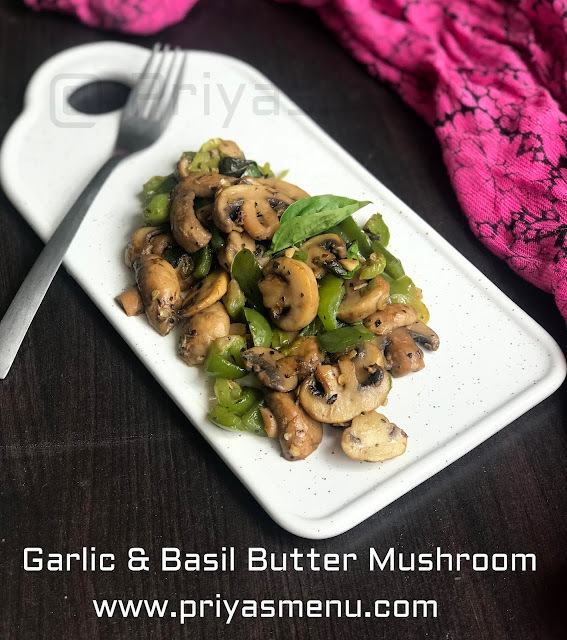 Thank you so much for your participation poorni and for sharing very healthy n delicious recipe. Friends… Stay tuned for meeting another interesting blogger next week. glad to know more about Poornima, love her space. A software engineer turned as a food blogger,just simply wow;..
super easy snack n healthy 1...love d roses on top(header)..